Lalbagh the oldest garden of Bangalore is home to some of the biggest and tallest trees of Bengaluru. The ones topping the list are silk cotton trees, eucalyptus trees, rain trees and Christmas trees. In terms of girth and spread, I think silk cotton rules are masters. 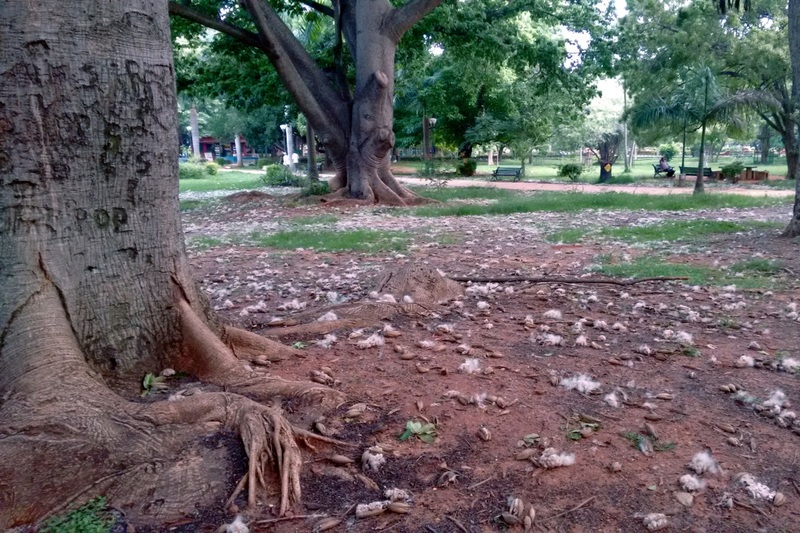 There are about 15 silk cotton trees spread around the garden; 2 close to West gate; half dozen near Siddapur gate, and remaining around Glass house. The most popular giant is the one near West gate, this tree literally doesn't have a trunk.. its seems its roots transition into branches. 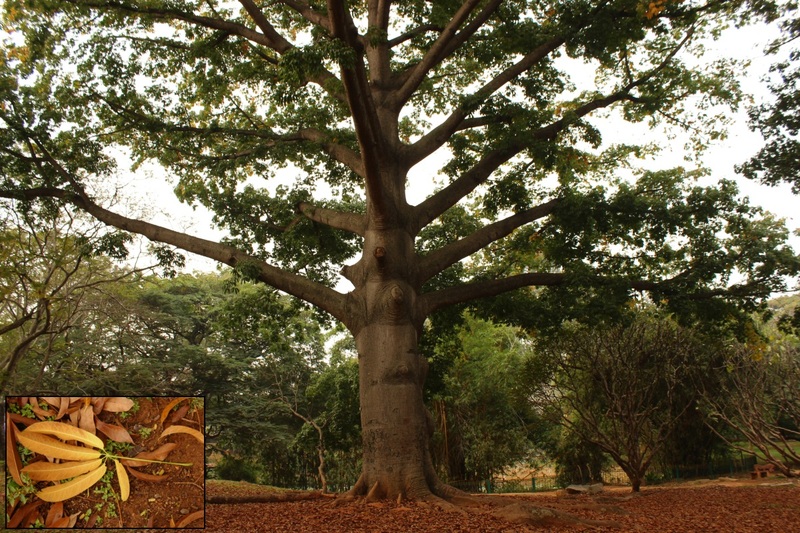 A big soft wooded deciduous tree, grows to an height of 25 to 30 meters with buttressed trunk, pinnate leaves with 5-7 leaflets. Huge orange scarlet, fleshy flowers with five petals, overlaid with glowing crimson colour, blossoms during spring season. 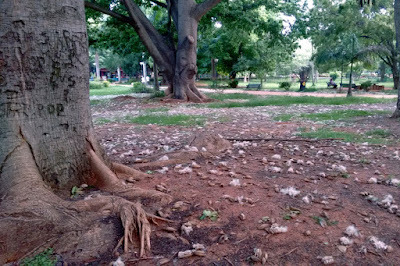 White silk cotton sticks obtained from fruits will be used for making pillows and beds. The wood is very light, hence used for making match sticks and packing cases. 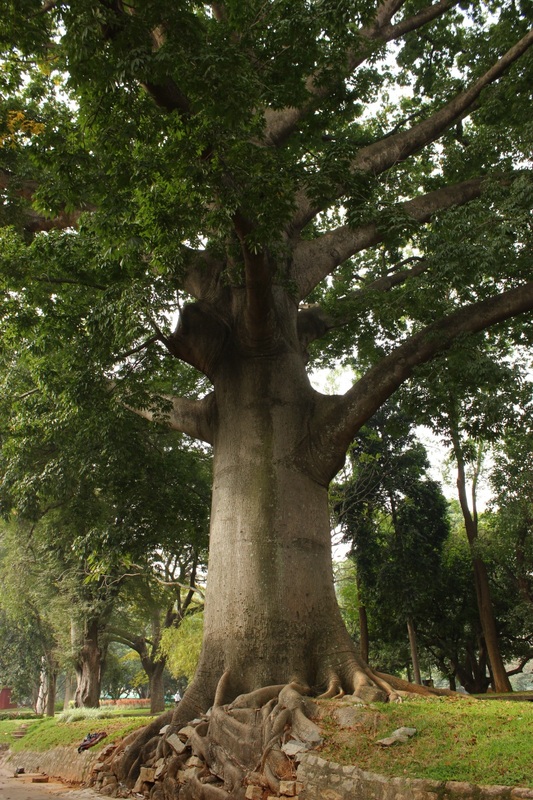 This tree is approximately 200 years old. 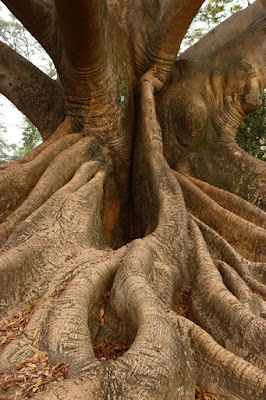 Thick roots form hollow spaces large enough for an adult human to hide.. I think this tree must have suffered a main trunk damage when it was young.. probably it broke off. Not willing to give up, branches must have shot off in all directions. I could be wrong..
Close by is another white silk cotton, slightly smaller then the one above. This tree does seem to have a main trunk; few of its branches are as thick as the main trunk. 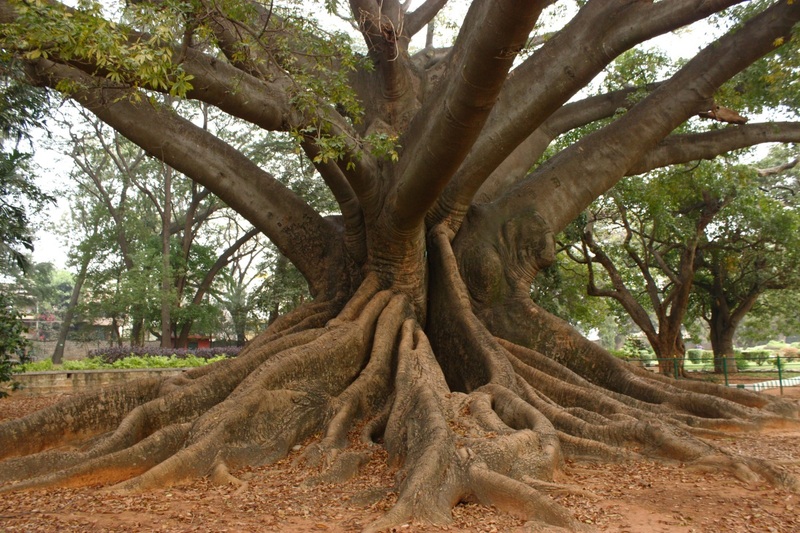 Here's one which has a normal tree structure- a regular trunk and well arranged branches. This is situated between Glass House and Lotus Pond, near Devil's Tree. Take a closer look at its pinnate leaf with five leaf lets (see inset). The tree starts flowering during March-April which turn into dark-green pods filled. The tender pods turn brown as they ripe. By mid-June the pods start bursting exposing the white silk-cotton within. Pods are shed by end of June through July. Here are a pair of fully ripe pods and silk-cotton. Why is it called silk-cotton? Because it looks like cotton and feels like silk. 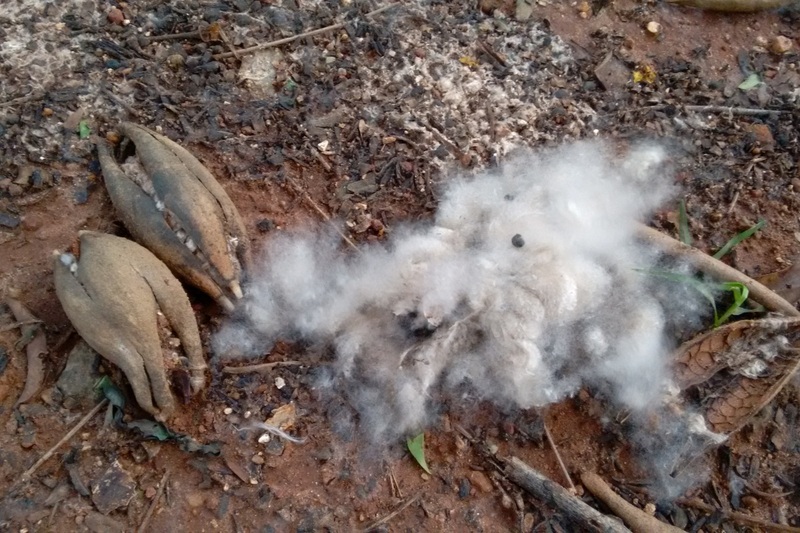 As a kid we would light fire to dry silk-cotton.. its burns off in a second with a whoosh. 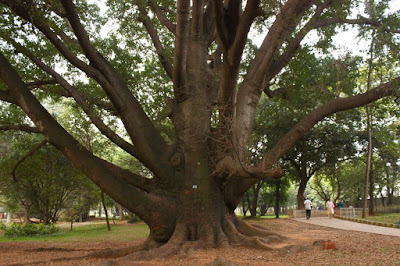 Lastly we come to the most beautiful silk-cotton tree of Lalbagh.. this is right next to the horticultural nursery. 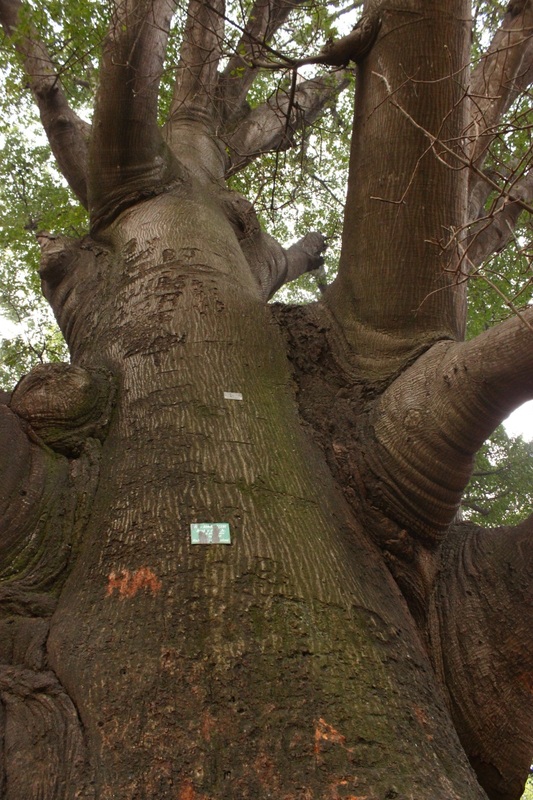 Its massive trunk is straight and its branches seem like massive arms. 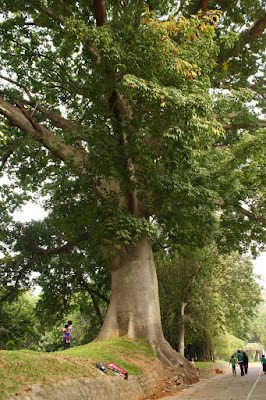 Another view of the same giant, notice how small humans look next to it. 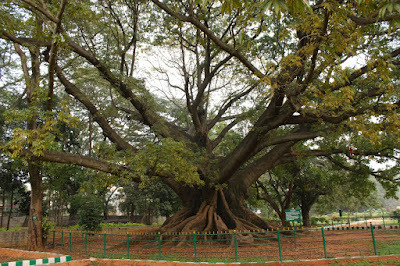 One tree Lalbagh should have had is a Baobab tree.. probably Bangalore cool climate does not suit it. Thanks very much. 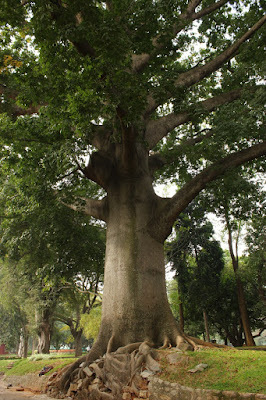 In the Bangalore Botanical gardens we found a similar ore maybe bigger white silk cotton tree. There is a Baobab tree in Lalbagh near the fish tank building.